WATCH a recording of a 20-minute webinar about the Iceland Tour with Allen and Gwenanne Jorgenson. Transfer to your hotel in Reykjavik. Enjoy the sights in this striking capital city on a walking tour led by a local guide. You may even get the chance to learn some Icelandic during a language lesson with a local family. Tonight, share a meal with your travel companions and learn more about the days to come. Attend a morning service at Hallgrimskirkja Church, both an architectural marvel and one of the tallest buildings in Iceland. After lunch, take some time to explore Reykjavik at your leisure. Possible sightseeing opportunities include climbing the tower of Hallgrimskirkja, exploring Lake Tjörnin, and seeing City Hall. Depending on performance schedules, evening activities may include an optional concert at the Harpa Concert Hall. 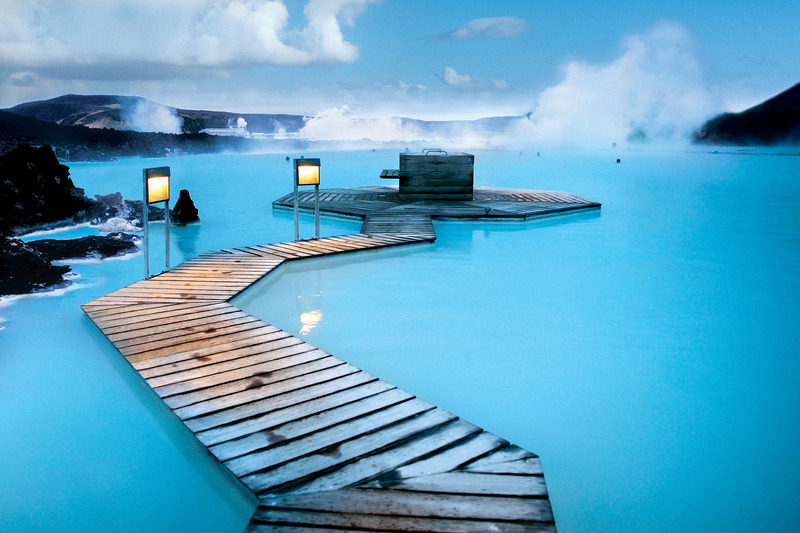 The Blue Lagoon in the Reykjanes Peninsula is one of the most celebrated attractions in the country. With crystal-blue waters and temperatures reaching close to 40°C, the lagoon is not only an attractive Icelandic landmark, but has been used as a research centre to help find cures for skin ailments using its mineral-rich water. Also visit the Hellisheiði Power Plant Geothermal Energy Exhibition, where you’ll learn about the history and current geothermal energy in Iceland through multimedia displays that even include an earthquake simulator. Today, travel to the town of Akureyri, and stop for lunch at a local cantina. Spend the afternoon exploring the city, and perhaps attend an optional whale-watching excursion in the evening. En route to Mývatn Lake, stop at Goðafoss Waterfall, which translates to “Waterfall of the gods.” Explore the lava formations of Dimmuborgir, and the geothermal area of Námaskarð. This barren landscape might make you think you’re strolling on Mars! On your way to Borgarfjörður for the night, see the Dettifoss Waterfall, one of the most powerful waterfalls in all of Europe. Depart beautiful Borgarfjörður for a trip down the coast, driving through the majestic eastern fjords. On our way to Höfn, catch a glimpse of Vatnajökull glacier, Europe’s largest ice cap. While at the Jökulsárlón Glacier Lagoon, you might spot seals sunbathing on the ice and icebergs floating on the lagoon’s clear, blue waters. An optional boat excursion will take you deeper into the lagoon. Continue on to Skaftafell National Park, where you can hike on a range of trails. See mountains, glaciers, and unique flora and fauna while in the park. Reynisfjara Beach, with its enormous basalt stacks and roaring waves, is a beautiful example of the black sand beaches of Iceland. Continue along Iceland’s Golden Circle trail to Drumbó, making stops at the Seljalandsfoss and Skógafoss waterfalls, where you can explore a small cave that lies behind the mouth of the waterfall. Finally, make your way to the Geysir Hot Springs. These highly active hot springs spout water 30 feet into the air every few minutes! Cap off an exciting day of sightseeing at Thingvellir National Park, where you may see the ruins of the Thingvellir Church and ruins of old stone shelters. Arrive in Reykjavik for your last evening in Iceland. Depart for your home countries with exciting stories and memories that are sure to last a lifetime.